It had a playoff feel right from the drop of the puck, but that’s the way it tends to be when the Boston Bruins and Toronto Maple Leafs take to the ice against each other. Still, with two empty-net goals and the winner coming with just under two minutes left in the period, the Leafs were able to pick up two big points in the Eastern Conference wild card standings. They sit just two back of the Bruins in the Atlantic Division and now have a comfy seat in the second wild card spot, but they still control their own destiny. The Bruins, on the other hand, played their hearts out and know exactly what’s on the line. There’s a really good chance of them making the playoffs, but the two points they lost to the Leafs in this 4-2 loss could realistically come back to haunt them. Time stood still by some standards at the Air Canada Centre on Monday night with the clock at the Toronto arena wouldn’t work to start the game. So, with coaches and referees keeping their own time going, the two teams got under way. There were chances to open the game, but it didn’t long for scoring in this playoff-style game to get going. Just over seven minutes into the game, Brad Marchand stole the puck from a hesitant Jake Gardiner at the red line before stick-handling his way into the Leafs zone. He got the puck over to David Backes who waited before firing over the glove of Frederik Andersen and just like that the Bruins led 1-0. Shortly after the goal, Torey Krug had a chance, but he shot the puck off teammate Matt Beleskey’s head in front of the net. Fortunately, Beleskey was alright and the play went back the other way. Midway through the frame, Auston Matthews set up Roman Polak with a chance from the top of the circle, but Tuukka Rask was able to make the save. Just over 12 minutes into the frame, things started getting chippy. Connor Carrick took down David Pastrnak has he tried to get at a puck that Andersen was covering up, but Pastrnak didn’t seem to like that. He got right back up and went back at Carrick before being pulled away by Andersen. That was followed up by a dangerous hit from Nikita Soshnikov on Patrice Bergeron in the corner. Kevan Miller responded by going after Soshnikov with Bergeron heading in the same direction after he got up from the hit. Both Soshnikov and Bergeron were handed two-minute minors and the Leafs took advantage. After controlling the zone for a little bit, including chances by Marner and Rielly, Marner fired a pass across the Bruins end to a streaking Rielly who put the puck on net. It ricocheted off Rask before hitting Rielly again and finding the back of the net. Andersen kept the game tied, coming up with two big saves off the sticks of Bergeron and Riley Nash with just under five minutes left to play. Kevan Miller followed that up by high-sticking Nazem Kadri before Bergeron fired the puck over the glass to give the Leafs a two-man advantage. But the league’s number one power play couldn’t get anything done and the period ended at a 1-1 tie. The second was played a much higher tempo, but there wasn’t much to get excited about. Zaitsev took a careless penalty just over four minutes into the period when he cross-checked Marchand after the whistle. But the Leafs were able to kill off the Bruins man advantage. The Bruins followed the kill with a chance on Andersen. Frank Vatrano was sent in all alone, but Andersen was able to come up with the big save. The Leafs followed that up with a chance of their own as van Riemsdyk set up Hunwick coming in from the blue line, but Rask made the save. Andersen added one more big save off Acciari, but with that the period ended still tied with the Leafs leading in shots 22-21. The third was a lot like the second – back and forth with a lot of opportunities. There was a playoff feel to the game and both clubs were desperately looking for the two points – neither wanting it to go to overtime. Midway through the period, Marchand was back to his pesky ways. It seems that he bumped Andersen behind the play and Komarov went straight for him. The two exchanged words and shoves on the ice before continuing the conversation between their benches. The rough stuff didn’t stop there, either. Just over the 12-minute mark, Chara and Martin were both sent off for cross checking. Five minutes later, Dominic Moore got slapped with a two-minute minor for interference on Soshnikov. And that’s when the Leafs got going. With the power play set up in the Boston zone, the top unit went to work. Zaitsev kept it in at the line and passed it over to van Riemsdyk. 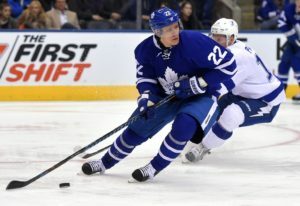 He found Bozak in the slot and with a slight hesitation, Bozak slid the puck under Rask to give the Leafs the lead with just under two minutes left in the game. Just 40 seconds later, Matthews blocked a shot in his own end before getting the puck to Nylander. Nylander turned at his own blue line fired the puck down the ice and into the empty net to give the Leafs a 3-1 lead. Twenty seconds after that, Kadri backhanded his own empty net goal into the Bruins open cage with a backhanded shot from in front of the Leafs bench. While it didn’t mean much, a poor exit pass by Soshnikov turned into a Bruins turnover. After it was shot on Andersen, Moore picked it up and waited for Andersen to go down before putting the puck up and over him to make it 4-2.